This is our section of professional racks. You will find all kinds: storage in general for sound equipment and accessories, for live mixer, for amplification, etc. Here you will also find a dj table, so you can assemble your set and start your session quickly anywhere. Walkasse Flight Case Yamaha® MGP32XD/ Allen&Heath® GL2400-432 Silver (Wheels). Walkasse Flight Case Rackmount DJ 19" /10U Silver. Walkasse Rackmount 19" and 8U. Walkasse Rackmount 19" and 4U. Foam for Mic. 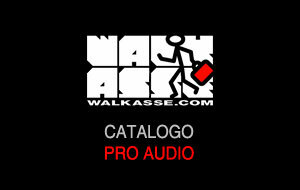 Walkasse Universal DJ table 50" (1290mm). Flight Case Multi Format XL 730mm Pioneer® XDJ-RX2 Black (Trolley & Wheels).